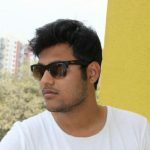 Global Market Insights has recently added a report on Commercial refrigeration equipment market which provides a succinct analysis of the market size, revenue forecast, and the regional landscape of this industry. 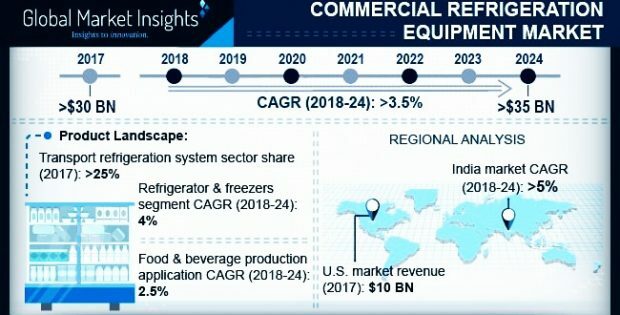 The report also highlights the major challenges and current growth strategies adopted by the prominent companies that are a part of the dynamic competitive spectrum of this business sphere.Commercial Refrigeration Equipment Market is projected to surpass USD 35 billion by 2024. Growing demand for frozen products across the globe is the primary driver for the industry growth. Vegan and meat-eating consumers are increasingly looking for quick and easy solutions for their daily meals due to their busy schedules. According to the report published by One Green Planet, in 2016, 26% of the U.S. consumers are shopping for the frozen food products more frequently than in 2015. The commercial refrigeration equipment market will grow significantly due to increasing investments in the food and beverage industry. In light of growing population, the players in the food and beverage industry are increasing the production to keep up with the continuously growing demand. For instance, the direct investment of Canada food processing abroad industry in 2013 was over USD 8 billion. Growing demand for the transportation refrigeration equipment is expected to propel the commercial equipment refrigeration market due to increased trade of food products, thus increasing the commercial refrigeration equipment market growth. According to the World Trade Organization, the total food exports accounted for more than USD 1,400 Billion. Reduction in investment barriers in countries including India, Japan, and Singapore are allowing the food product manufacturers from countries including U.S. and UK. This is encouraging the foreign players o supply high quality food products in the countries that do not produce quantities that cater to the increasing demand. The growth in food and beverage distribution industry due to large scale transport of processed food across the globe will propel the commercial refrigeration equipment market growth. The demand for processed and packages food & beverages is rapidly growing due to the awareness regarding their nutritious value. Consumers are increasingly demanding frozen fruits and vegetables due to their increased shelf life. Also, the consumers are increasingly demanding frozen forms of perishable fruits such as berries. Asia Pacific commercial refrigeration equipment market is expected to witness growth due to rapidly growing GDP and emerging middle class in countries including India and China. Increasing disposable income and increasing number of women professionals is increasing the consumption of frozen foods in the region. Growing sea food industry in countries including Japan, South Korea, China, and Malaysia will augment the industry growth. Some of the key vendors in the commercial refrigeration equipment market include Ali Group SPA, Daikin Industries, Dover Corporation, AB Electrolux, Johnson Controls, and AHT Cooling Systems GmbH. Technological advancements such as implementation of IoT are providing opportunities to the manufacturers to develop advanced products.